Today on Serious Grape: Why Read About Wine You'll Never Drink? 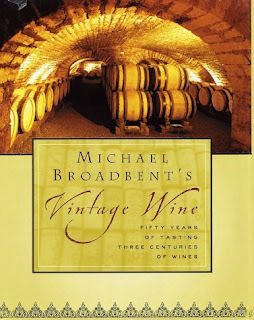 If you are often frustrated reading wine magazines, wine books, and wine reviews that focus on wines you can't find in your local store, you may wonder why I am addicted to Michael Broadbent's Vintage Wine: Fifty Years of Tasting Three Centuries of Wines. This book collects his tasting notes for the oldest, rarest, and most coveted wines in the world. Today on Serious Grape, my weekly column on Serious Eats, I explain why I love reading about wine I'll never, ever be able to drink, like the 1811 Chateau Yquem from the "comet vintage." For me its a vicarious pleasure akin to reading People magazine or Vogue, and it combines two of my favorite other pleasures: history and mystery. If you don't know Michael Broadbent's book, it's an awe-inspiring trip through some of the oldest and most expensive cellars on the planet. And because there's no conceivable way most of us will ever be able to buy any of the wines he tastes here, there's none of that frustration--just pure enjoyment. If this sounds like something you might find fun, or you are looking for a gift for a wine lover, check out today's post. Last weekend I enjoyed some wine travel and conversation with Jill from domaine547 and nearly two hundred other wine friends and family at the 2008 Wine Bloggers' Conference in Sonoma. One of the events I enjoyed was the vineyard walk on Saturday morning led by Zephyr Adventures. We went to Saralee's Vineyard in the Russian River Valley, where we met up with Rich and Saralee Kunde (who made us a fabulous lunch! ), Daniel Moore of Zmor Winery, and Rod and Lynn Swan Berglund of Joseph Swan Vineyards. We hiked through the vineyards, learned a lot about the area and its viticultural heritage, and drank some fantastic wines. I hope this slide show whets your appetite to learn more about the Russian River Valley appellation, and makes you feel that you've been able to enjoy a little bit of this year's fall season here in the California Wine Country. If you're interested in seeing more pictures of the 2008 Wine Bloggers Conference, head over to my Flickr photostream where I've set up a collection of pictures for you to flip through. I came back from the first Wine Bloggers Conference in Sonoma this weekend and there was one thing I knew for sure: I didn't want to drink any California wine. I needed a change. I caught up on my mail and read the backed up blog posts in my RSS reader and inspiration hit: I was going to drink an Argentinian Malbec. This inspiration stemmed from two of the people I met at the conference (though I've known them via the blogosphere and Twitter for some time now): David from the blog Vinomadic, and Philip James from the wine finder and keeper site Snooth. David lived in Argentina for a time (and always gives me good suggestions on what to drink), and Snooth just had a tasting dedicated to value Malbecs. I enjoyed talking to both of them this weekend, and that was enough to send me scurrying to the cellar in pursuit of an Argentinian Malbec. The wine that I pulled out was the 2006 Finca Las Moras Malbec Reserva (sample; suggested retail for this new release is $12; you may find it or other recent vintages near you for between $7 and $12) This wine was a simple pleasure from start to finish, because it was made in an apologetically New World fruit-forward style, but with some sensitivity and restraint. Malbec is often described as fitting somewhere between Merlot and Cabernet Sauvignon in the flavor spectrum, but what I always think of is plums--lots and lots of plums. The 2006 Finca Las Moras Malbec Reserva did indeed have prominent aromas of plum, leather, and vanilla. These aromas were echoed in the flavors of plum and spice, and there was also a nice meaty note that gave the wine some depth of complexity. Very good QPR for this wine brought into the US by Joshua Tree Imports, who are known for their good value brands such as Razor's Edge and Fetish. I love lamb with Malbec, and so we had this with Lamb Chops and a tomato-and-potato gratin. If you are vegetarian, I highly recommend making the gratin, and having it with some meaty grilled portabello mushrooms instead of the lamb. Whether you go with meat or a meatless option, you'll find that the meaty, leathery aromas and flavors will get drawn out by the grilled food and the beautiful plum fruit will be a nice complement to the earthy potatoes and sweet tomatoes. Thanks to David and Philip for helping me get inspired about wine all over again. See you next year at the Wine Bloggers Conference! 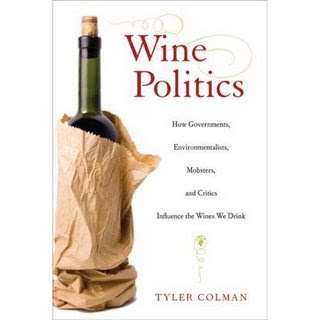 By the end of Tyler Colman's excellent book, Wine Politics: How Governments, Environmentalists, Mobsters, and Critics Influence the Wines We Drink, I could only come to one conclusion: it's a miracle that we are able to find anything at all that is decent to drink. Welcome to the 5th Edition of the Wine Book Club, the online book club for wine lovers who also like to read. I'm the host for this month's event, and for my theme I was inspired by the season. What better way to celebrate September and October than to read a book written by a genuine PhD (September is back to school month) about wine and politics (we are in the midst of an election)? This idea was even more appealing given that the author may be better known to those of you who read wine blogs as Dr. Vino, the award-winning wine blogger. Colman's book compares the way that politics has shaped wine culture in France and America. One of the most striking things about the story he tells here is that, along with politics, there are two other "P"s that have played an equally active a role in determining what you drink: phylloxera, the louse that destroyed grape vines all over the world in the 1870s; and Robert Parker, the critic who began telling us what we should drink in the 1970s. Phylloxera, it turns out, led to such a collapse in the worldwide wine business that it opened the door to greater governmental control and intervention as people sought to limit fraud, graft, corruption, and lost income. And Parker helped people to wade through seas of indifferent wine with misleading labels at a time when Americans were still drinking like it was Prohibition and they'd rather mainline the hard stuff than drink a glass of wine with dinner. The ripples he sent out from his one-man business in Monkton, Maryland in the 1970s now threaten to engulf us in wave after wave of homogeneous wine made to please Parker's influential palate. I consider myself reasonably knowledgeable about wine history, but I was surprised again and again by the nuggets of historical lore and sharp analysis that Colman includes here. Lately, I've been wondering why we don't buy wine in bulk here in the US like they do virtually everywhere else in the world. Turns out it's due to a combination of Prohibiton (and the resulting patchwork of legislation) and something called the Office of Price Administration that was established in World War II. Until then, wine was shipped in tanker trucks and on the rails to 1500 bottling facilities studded all over the country. And thus the enormous carbon footprint of wine began! Colman's message is sobering, even though his book is a delight to read with its clear prose and fluid style. The bottom line is this: when money, egos, and bureaucracy collide--as they do in the wine business--it becomes almost impossible to do what is best for consumers, the environment, and the winemakers themselves. With everybody taking a cut in wine sales, from the bottle makers to the distributors to the retailers to the government, it really is astonishing that anyone bothers to make wine at all. And in case you're thinking the situation is better in France, let me assure you it isn't--it's just different. If you enjoy Colman's blog, you are in for a treat since this book is written in the same direct, engaging style as his blog posts. The book has great graphic features (like a comparison of how politics shapes French and American wine blog labels) and informative sidebars that offer the reader opportunities to pause and consider the issues from a fresh perspective. I highly recommend this book, especially if you find yourself wondering why you don't know what grape is in a French bottle of wine, or why it is that an American wine is labeled "Cabernet Sauvignon" when 25% of the grapes in it are Syrah. The answer to both questions is simple. Wine Politics. After reading this book, you'll never think about the relationship between the two in the same way again. 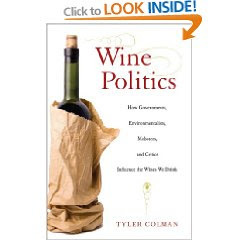 Tyler Colman's Wine Politics: How Governments, Environmentalists, Mobsters, and Critics Influence the Wines We Drink was published by the University of California Press, who sent a copy of the book to me for review. It retails for $27.50, but you can buy it on Amazon.com for $18.15. If you are participating in this month's online club, please leave comments and/or links to your own posts below. You can also leave links at the Wine Book Club site, or on our mirror site on Shelfari. This month's trip through the wines of Umbria ends on a high note with a very good QPR white wine made with a distinctive grape called Grechetto. Grechetto is not, strictly speaking, an indigenous Italian grape. Its origins can be found in Greece (hence the name) and has been used extensively as a blending grape. In Lazio, for instance, the Antinori family blends Grechetto with Chardonnay to make their famous white wine, Cervaro. 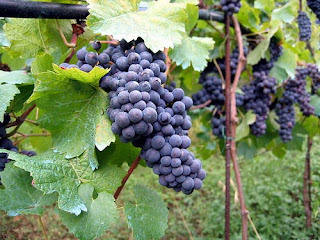 In Umbria, however, the grape is increasing in popularity and being used to craft rich, full-bodied white wines with a distinctive flavor profile. And the good news is that an Umbrian Grechetto is affordable, too. 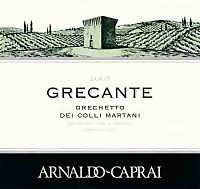 I tried an Umbrian Grechetto in the 2005 Arnaldo-Caprai Grecante from the Colli Martani DOC. ($17.99 in my local Bristol Farms store; available elsewhere for $9-$24). This yummy, distinctive wine was truly golden in color, with plentiful autumnal aromas of pears, herbs, and honeycomb. It was slightly spritzy upon first opening, which dissipated quickly. The wine's flavors also developed in the direction of late summer and fall orchard fruits, such as pears and white peaches. There was a zingy flash of lemon pith in the aftertase, which kept it from feeling too sweet or cloying. This well-made wine went as well with a Thai chicken stirfry (which brought out its peachy character) as it did with an Umbrian-style cacciatore with lemon, capers, and anchovies (which brought out its lemony side). Grechetto turns out to be a versatile, food-friendly grape, as well as a great bargain. Have you tried Grechetto? If you have any particular labels that you like, let me know in the comments below, because I'd love to sample some more wines made with this grape. If you are tired of drinking Chardonnays that don't taste the way you want them to, it's time to ask yourself if you have passed Chardonnay 101. Today on Serious Grape, my weekly column on Serious Eats, I cover the basics of how to read a Chardonnay label. Included are discussions of how to figure out from the alcohol level, malolactic fermentation, and oak used in making the wine whether you are likely to enjoy it or not. 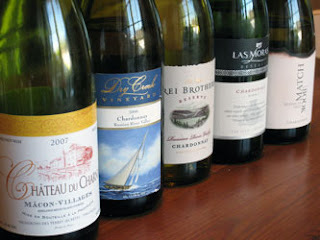 Plus, there are mini reviews of five Chardonnays under $20. Click on over and check it out, especially if you are looking for some nice white wine options for the upcoming Thanksgiving holidays. Of course, there's a lot more to Chardonnay than just alcohol, malolactic fermentation, and oak--but that's for a more advanced class! It's been a while since either of us have been on a road trip, but today we're off to Paso Robles to visit Tablas Creek and other great wineries, and then to Sonoma to participate in the first ever US Wine Bloggers Conference. We'll be covering the state from LA to Santa Rosa, so wish us luck as we take the old Camry Hybrid out for a spin. We expect to taste a lot of good wine, take some pictures, and be back on Sunday with lots of news to report. Tomorrow's Serious Grape post will be up as usual, but please be patient if I don't respond to comments for a few days. Spanish Wine: It's Synonymous with "Value"
If you're looking for value wines these days, I have one question for you: are you looking in the Spanish section? When I was in Spain, I was struck over and over by the way the wines of the region were simple and straightforward in the best sense. First, Spanish wines represent great, great value. Second, they're food friendly. They go with the kinds of meals that we eat these days because even the reds are fresh and flavorful. And finally, they celebrate local flavors by growing indigenous grapes. My latest Spanish wine, the 2006 Vionta Albariño Rías Baixas, exemplifies what I love about wines from the Iberian peninsula. (sample; you should be able to find it near you for $10-$25). 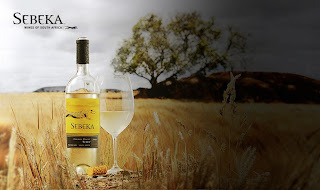 It's got great taste, great value, and it's made from the native Albariño grape. This excellent QPR wine had a beautiful gold color. I smelled autumnal aromas of super-ripe apples and juicy pears. The apples continued on through the flavors, and there was a slighlty honeyed note as if wedges of Golden Delicious apples had been dipped in warm Clover honey. The wine left a juicy aftertaste in your mouth, and because of the excellent acidity it never got cloying or heavy. We had our Albariño with some delicious homemade fish tacos with a lime-cilantro sauce that really paired nicely with the fresh apple and honeyed flavors of the wine. And the wine's juicy acidity handled all the different spices just perfectly. This wine has a huge price swing depending on where you pick it up, but it is widely available. My parents found it in their local PLCB store, and all I can say is if you can find it in Pennsylvania, you can probably find it anywhere. If you can get this for less than $15 (which seems to be the average price point), I think you'll be very pleased with your purchase. So if you're looking for wine bargains, don't forget to look in the Spanish section. And feel free to leave your latest Spanish wine tips in the comments below. It will come as no surprise to anyone who reads this blog regularly that I love Sonoma Coast Pinot Noir. I love its style, its class, and the way that the cool growing temperatures seem to give the wines a depth and complexity that make them wonderful dinner companions. I don't drink as much Sonoma Coast Pinot Noir as I would like to, however, because wines from this region--especially wines made with the world's most finicky grape--can cost a pretty penny. So it's always a great discovery when I find a Pinot Noir that has all the good taste I crave and excellent QPR as well. 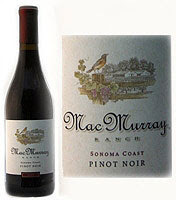 Just in time for the holidays, I've found such a wine: the 2006 MacMurray Ranch Sonoma Coast Pinot Noir. I received this as a sample, but you should be able to find it in most places for between $12 and $20. MacMurray Ranch was purchased in 1941 by Hollywood actor Fred MacMurray, and today Australian-born Susan Doyle sees her role as winemaker as one that depends on a combination of science and art. The results of this combination, if this bottle is any indication, are excellent. This was a superb Pinot Noir for the price. It had lovely aromas of spice, cherry and raspberry fruit, and flowers. These were enticing, and made you want to swirl and sniff for a good, long time before you even took your first sip. When you did, you were struck by flavors of high toned black cherry, allspice, and fresh-baked raspberry cobbler. The wine had a surprising depth as it went over your tongue, so if you like your Pinots to have nice body and good balance, you will like this wine. Even though the wine was full of fruit flavors, there was a nice silkiness of texture--which for me is one of the real delights in drinking a well-made Pinot Noir. The whole experience was rounded up with a spicy aftertaste that was mouthwatering and only made you want more. If you see this wine for under $20 it's a steal, and I highly recommend that you buy it and keep it on hand for when you're serving soups, stews, anything with mushrooms, or pork dishes this autumn. Pinot Noir is one of the world's most versatile food grapes, so there is almost nothing this wine wouldn't go with--including turkey if you are looking for a red wine for Thanksgiving. In a world full of overpriced Pinot Noir that often doesn't deliver in the taste department (even if it does cost a lot), it's a joy to drink such an affordable, well-made, and classy Sonoma Coast Pinot Noir. It's that time of year--when the ghosts, goblins, witches, and vampires come out to play. But why should the kids have all the fun? This week on Serious Grape, my weekly column on the food site Serious Eats, I suggest six wines that will set the right mood for whatever grown-up fun you've got planned. All six wines taste great, and represent great value. 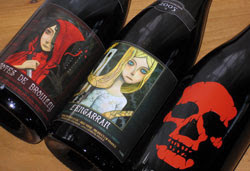 The most important thing, though, is that all six of the wines come complete with Halloween costumes, as the labels above indicate. From the Beaujolais to Calaveras County, from the Rhone to Lodi, and from the hills of California to the mountains of Oregon, I've got a Halloween wine that you'll want to drink and serve. Click on over and check my recommendations, and if I've missed a Halloween-appropriate label be sure to leave your suggestions in the comments. Don't forget your local wine store during these tough times. It can be easy to do. You decide to shop the sale at BevMo. Just this once. But now more than ever we need to support the independent retailers--both locally and online--who have brought us so much great wine and given us so much good advice over the past months. These small business owners are hurting now, too, and your purchase today can help to make sure that they're still there to shop from when the markets rebound and you're looking for a great bottle of wine from the Loire. Just try finding that at the supermarket. 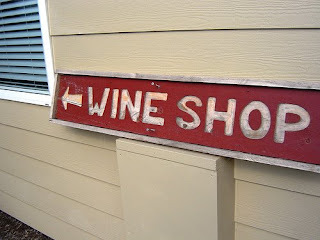 Jancis Robinson's recent article reminded me how much I depend on independent retailers--like Chronicle Wine Cellar, domaine547, Mission Wines, and the Walla Walla Wine Woman--to share their knowledge and expertise with me and to guide me towards the wine that I want to drink. Times are tough. But living without independent wine retailers will be even tougher. This weekend, buy a bottle of wine from someone who has given you great service in the past, and help ensure that they're still there in the future. Otherwise, we're looking at a bleak picture filled with chain wines and chain stores. Do what you can to fight for your wine independence. Support your local independent retailers--TODAY. Chenin Blanc is one of those grapes. You know the grapes I mean. They're the ones that you think you know because once upon a time someone poured you someting out of a giant jug that said it was Chenin Blanc. It was awful, and you've never touched the stuff since. It's time to try it again. There are some great value Chenin Blancs in the market right now. Why should you try Chenin Blanc? Here are three reasons. First, they are versatile food w ines because they have good acidity and a slightly off-dry personality that makes them go as well with roast chicken as they do with Kung Pao chicken. Second, they are great values because everybody's bad experiences with Chenin Blanc has made them head straight for the Chardonnay. The result? Chenin Blancs deliver excellent QPR. And third, Chenin Blanc is grown throughout the world. What this means is that you can find Chenin Blanc from almost any region, and at almost any pricepoint. Today, I'm focusing on two new releases of Chenin Blanc--one from the US and one from South Africa. Both are excellent QPR choices, that deliver abundant varietal characteristics at a very attractive price. And both are widely available. The first is the 2007 Dry Creek Vineyard Dry Chenin Blanc from Clarksburg. I received this as a sample, but you should be able to find it near you for between $9 and $14. The wine had honeyed melon aromas that were rich and enticing without being heavy or cloying. These aromas gave the wine a sweet impression, but flavor-wise it as dry and crisp with Meyer lemons, melon, and herb notes. What most impressed me about this wine was that it continued to open up and develop in the glass over the course of our evening. Sometimes it seemed more melony, then the herbs would kick in and surprise you. We enjoyed this with spicy food, and I would particularly recommend it to those of you who are looking for something to go with Indian or Southeast Asian food. The second wine I enjoyed was the 2008 Sebeka Chenin Blanc from South Africa. This was also a sample, but near you expect to pay between $5 and $9. This snappy Chenin Blanc had lots of pineapple and tropical fruit flavors and aromas. The intensity of the fruit was kept in balance by lots of acidity, and the wine left a slightly sweet impression in your mouth. This bottle we popped open to enjoy with fish tacos and mango salsa and it was excellent. But it would also be a terrific choice if you were just looking for a refreshing white wine to serve to friends before dinner. These days most of us are looking for ways to stretch our money a little bit further without sacrificing great taste. Here are two wines that will enable you to do just that. Give Chenin Blanc a try, even if you swore off the stuff in 1982. It really is time to give it a second chance. Just a few news updates today, so get out your calendars and mark down these online wine blogging events. First, on Tuesday, October 28, we'll have the Back to School/Politics 5th edition of the Wine Book Club. Join in as bloggers and readers throughout the blogosphere review and discuss Tyler Colman's new book, Wine Politics: How Governments, Environmentalists, Mobsters, and Critics Influence the Wine We Drink (University of California Press; $18.15 through Amazon) You may know Tyler Colman as Dr. Vino, who is hands down the best wine blogger out there. But the reason to read this book is not just that he's a wine blogger--he's an expert on this subject, and I can say (halfway through the book) that his writing is every bit as engaging and provocative here as it is on his blog. It's easy to take part--get yourself a book, read it, and join in the conversation by posting a review on your own wine, food or book blog. You can also chime in the comments here at GWU$20 or any other site taking part. Or, you can post reviews on our sites at the Wine Book Club and Shelfari. For more details, check out my announcement post. If you are a food, wine, or book blogger, I could use your help to post a reminder about this event. Participation has really dropped off since our bang-up start in January. 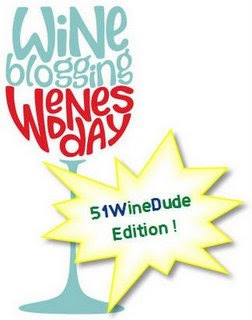 In other news, the theme for Wine Blogging Wednesday #51 has been announced by our host, Joe the #1 Wine Dude. The theme involves dessert wines, and Joe would like us to find something "baked"--as in Madeirized. In Madeirized wines have been intentionally oxidized to make them brown and nutty. Because they can be hard to find (except in Hungarian and Iberian bottlings) Joe has expanded "baked" wines to include wines that have been fortified (like sherries, ports, etc.) Reviews are due on November 12, and should give us all great ideas on what to serve for holiday dinners throughout the depths of winter. Here at GWU$20 you can look forward to some reviews of rare sherries that I tasted as a guest of Bodegas Osborne this summer, as well as a dessert idea using a "baked" wine. Have a good week everybody, and see you back here tomorrow with a new white wine review--actually, two! Merlot has really been kicked around the block since Sideways. In spite of the fact that Miles downs a considerable amount of Merlot in a fast food restaurant at the end of the film, large numbers of people now refuse to drink Merlot on general principle. This is good news for you and me. Because Merlot can be fabulous. Not everybody makes their Merlot grapes into blackberry jam. Some actually make it into wine. And because of the dip in demand, there is some great Merlot out there in the market that is priced to sell. I just had an Umbrian example of Merlot, and it was fantastic--and it in no way resembled a simple, over-oaked fruit bomb or a breakfast spread. 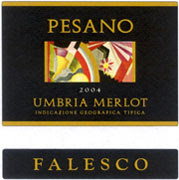 Instead, the 2004 Falesco Pesano Merlot was an excellent QPR steal for just under $12. I purchased the bottle back before this blog was born in early July 2006 for $11.99 at Costco. A quick search on Vinquire revealed that if you want a bottle of the stuff now, you can expect to pay $25.99 at the one retailer who sells it online. More recent vintages can be had for between $11.99 and $16.99 in case you want to try your luck. What did I experience when I pulled the cork? The first thing I smelled was fresh-ground coffee. Yes, not a breakfast spread, but a breakfast drink. This was followed by another breakfast smell: bacon fat. The combination was enticing and mouth-watering. In the flavors, I tasted cherry, blackberry, and more coffee bean. There was a smoky aftertaste that was quite distinctive. This was a lot of wine for $12 and I think that it probably benefited from the 2+ years that it received in my various storage spaces. We had it with meatloaf and potatoes, which was a perfect pairing for the meaty and smoky flavors in the wine, but you could just as easily pair this with a roast or stew. Yes, you could have it with an In 'n Out Burger if you must be like Miles. One of the wine mags gave this an 89, which in my opinion is just plain silliness. This wine was distinctive, widely available when it was released, and worth every penny that it cost and then some. If the more recent versions of this wine are anywhere near this good (and CellarTracker reviews of the 2005 vintage suggest it is) then you should grab this if you see it. You're in for a real treat. 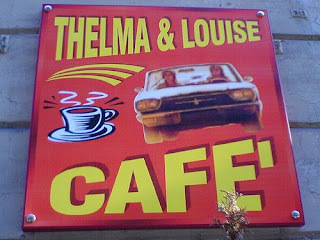 Eating on the road is a challenge, but managing to get a good glass of wine with your meal sometimes seems impossible. 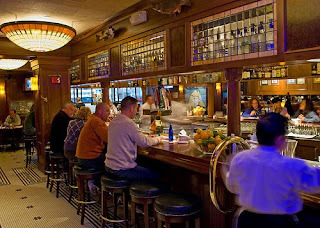 This week on Serious Grape, my regular column on the food site Serious Eats, I talk about my strategies for achieving something resembling normalcy when I'm dining alone on the road. We're not talking client dinners here--we're talking the nights when you don't have a client to meet and you are in desperate need of something restorative. For me that means interesting, fresh food and a glass of wine with dinner. Head over there and let me know what you think of how I deal with this challenge. Even better, let me and other readers know what your pet peeves are about wining and dining while traveling and how you cope with them. 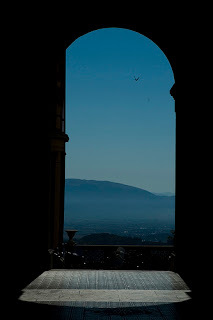 There you will find Assisi, where the troubadour-warrior-theologian St. Francis had his miraculous vision which led him to found the Franciscan order. Here too is Perugia, home to the Renaissance artist Perugino who somehow managed to capture the soft light of the region in every canvas he ever painted. And of course there's the fortress-city of Orvieto, where Pope Clement VII tried to escape the clutches of Charles V after Rome was sacked in 1527. You will also find wonderful wine. (photo of a vineyard in Montone by rdesai) This month, I'll be exploring the wine of the region, and finding out more about how the magic of Umbria works its way into the soil and the grapes to produce great bottlings made with both native and international grapes. 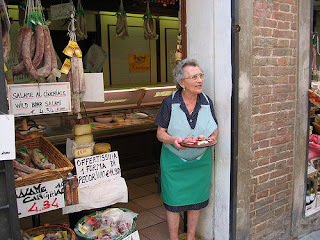 Umbria has some big producers (most notably Falesco, who has a base of operations here as well as in Lazio), but the tradition of small, family-owned wineries and vineyards has also been preserved. Today, many of these smaller wineries specialize in cultivating the region's traditional grapes like Grechetto, Sagrantino, and Canaiolo Bianco. 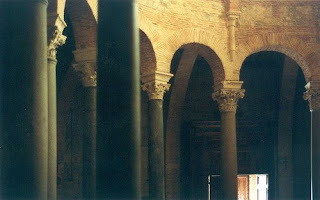 Can you tell I love Umbria? I do. It's one of the most beautiful places on earth in my opinion. Welcome to Wine Blogging Wednesday #50, hosted this month by Russ the Winehiker. He picked a great theme for us to think about this month: what wine would you take into the outdoors and share with your loved one on a walk, hike, or picnic? Russ promised to give us extra credit if we shared where we would walk, and even more extra credit if we actually walked the walk. Unfortunately, we're too busy giving extra credit to our students to go outside right now and earn some from the Winehiker, but if we could take a walk I know just what we'd pack up in the picnic basket: a bottle of the 2007 Clif Bar Family Winery The Climber White Wine that I recently had a chance to sample. 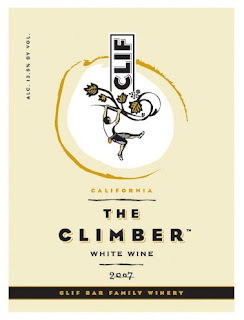 ($12.50 suggested retail; available online for between $10 and $15) The Clif Bar Family Winery was started by the same folks who brought us, among other treasures, the Mojo Bar which we find so necessary to survival that we buy them by the case at Whole Foods. The owners of the company, Gary Erickson and Kit Crawford, believe in good food, good wine, family, and enjoying the outdoors. What wine could be better-suited to this WBW theme? It's even packaged using a Stelvin screw-cap closure, so you don't even have to worry about packing a corkscrew. Of course, no matter what the wine-making philosophy or the portability of the wine, the bottom line is that it has to taste good. I'm here to tell you that this was a terrific, affordable white blend made with a core of juice from Sauvignon Blanc grapes. Pinot Blanc (12%), Chenin Blanc (4%) and Muscat (3%) were added, with the result that the wine has good acidity but an impression of softness--if not quite sweetness--that makes it very versatile and appealing. When I opened the wine, I immediately detected aromas of pink grapefruit and nectarine. These were followed up by flavors of Meyer lemon, nectarine, and white peach. The aftertaste was fresh and juicy, and you just wanted to keep on sipping it because of the bright fruit flavors. This excellent QPR wine will go with anything you like to have with a chilled white wine, from Chinese takeout to roast chicken to a crsip salad. If you're looking for a recipe to take on your hike or picnic, I highly recommend making some of the Spaghetti with Thai Peanut Sauce that we had. I subbed whole wheat spaghetti for the regular that the recipe called for, and substituted shredded cabbage and sliced cucumbes for the chicken. This not only made the recipe more healthy and suitable for vegetarians, it also made it portable. It's good chilled, too. I'm taking the leftovers into work for lunch tomorrow. And I'm packing a Mojo Bar for dessert. Thanks to Russ for a terrific theme. I'm looking forward to hearing what others would take with them when they head out into the great outdoors. That means we're entering our third year of good value wine coverage and conversation. 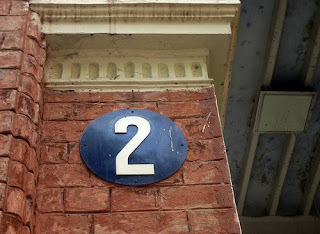 I'm pleased at how much the blog has grown over the past two years, and the credit for that goes to the readers like you who continue to come by, leave your comments and questions, and let me know what you want to see change. With more than a thousand daily subscribers and thousands of visitors more each week, I can honestly say that you are the best part of blogging. I would not still be doing this without your support and your overwhelmingly positive response to my perspective on the often expensive, and sometimes intimidating, world of wine. Thanks for stopping by and spending part of your day with me. Here's to a great third year--for all of us. During these fiscally lean times, you may want to have a wine that's big, juicy, and rich enough to make you forget the austerity budget that you may be facing these days. 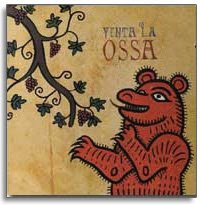 If you do, try the 2004 Venta La Ossa Tempranillo. I received this as a sample, but you can get yours from domaine547 for just $11 which is the best price I've seen on the 'net. This is a big, bold, wine from Spain that is made in an opulent, New World style. If you are looking for a restrained Tempranillo, this is not your wine. But if you are looking for fruit, you've found it. When I first opened it, there was some sense of alcoholic heat, but this quickly blew off and to be fair to the wine I think it was too warm. Once I'd cooled it in the fridge a bit, the alcoholic sensations were completely gone. This done, there was nothing standing between me and the aromas of black cherry and black raspberries. Both of these delicious, fruity aromas were also present in the flavors. Notes of cedar and vanilla emerged in the aftertaste, which were a nice counterpoint to the wine's smooth tannins. A newer vintage of this wine has been released, but this one is absolutely ready to drink now and I think you could even hold it for 2-3 more years. Excellent QPR. This is a hedonistic wine that's affordable. Get yourself some take-out carne asada burritos or tacos, pop this in the fridge for 20 minutes while you pick up your food or wait for delivery, and then enjoy escaping from the news coverage for a little while as you sip your Spanish wine. We all need an affordable escape. This wine can provide it. Today on Serious Grape: Back to the Barrels? I find myself much more sensitive to wine's environmental impact these days because of Colman's work. As a historian I am intrigued that we've been thinking about boxes and other new forms of packaging that might leave less of a carbon footprint than wine bottles when it comes to shipping--but we haven't been thinking as much about the very old-fashioned alternative of buying wines straight from the barrel. I buy all kinds of things from big, bulk containers in Whole Foods that I would never imagined I would buy this way ten years ago. I can even make jam and take it home in a plastic container if I'm really serious about lowering my carbon foot print! Of course, there are probably laws standing between me and taking a clean jug to Whole Foods to be filled with red table wine. But they can be changed. What do you think? Head over and join in the discussion. 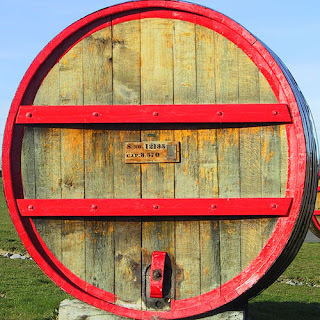 If you could, would you buy wine from the barrel? If not, why not? When I read the wine magazines--and yes, I do read them--there are times when I see an 89-point review and it seems like a travesty, based on what I think a wine delivers in terms of flavor and bang for the buck. Then there are are times when an 89-point review seems like over-inflated hype, for exactly the same reasons. And then there are the times when I wonder if a wine has received an 89-point review from a major magazine because somebody lost their nerve on the way to a 90+ rating and settled for something a little more safe. It often happens when the grape is weird, or unfashionable, or both. It can even happen when the winemaker or region is weird and/or unfashionable. Today I'm reviewing just such a wine: the 2004 Domaine de Bellivière Coteaux du Loir Le Rouge-Gorge. ($14.99, K & L Wines; the 2005 vintage is available from other merchants for $17-$25) It received an 89 from Spectator, and try as I might I wasn't able to find any Pineau d'Aunis that had ever received more than an 89 from the magazine. (I could be wrong on this point, but I spent 3 hours looking through the database before I gave up. If I am wrong, I'm sure that someone from WS headquarters will be by to correct me.) This 89-point and below niche for Pineau d'Aunis is surprising, given the fact that the wines are often described as exhibiting textbook varietal characteristics. So what's the deal? I'm not the only person asking this kind of question regarding wine scores. If you want to see what other writers are wondering about wine scores, check out dhonig's collaborative 89 Project blog. For those of you who aren't familiar with this effort, dhonig gathered up a bunch of interested folks and asked them to be on the lookout for wines that received 89-point ratings from the major wine critics. 89-point wines are, in the words of dhonig, "the red-headed step children of the wine world." The 89 Project gives us a chance to take a second look at some overlooked wines and, in doing so, discover some truly interesting and often affordable treasures that those who are slavish to shelftalkers will see right through at the store. Treasures just like Pineau d'Aunis. Domaine de Bellivière is a family-owned winery in the Loire that specializes in making wine from two of the region's traditional grapes: Chenin Blanc and Pineau d'Aunis. While Chenin Blanc has gained some traction among American wine drinkrs, Pineau d'Aunis is a relative rarity over here. And it's not likely to become any more widely accepted, given the fact that the wine normally scores below 90 points with most wine critics. One of the reasons for these scores may be that Pineau d'Aunis will simply not be to everyone's taste. It's a grape that actually seems to try to make you wrinkle up your face and wonder what you're drinking. The defining character of Pineau d'Aunis is often "pine"--a slightly resinous, green, and herbal quality to the wine that some people react to as if you'd just poured Pine-Sol into their Pinot Noir. 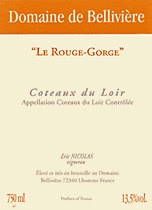 So what was my reaction to the 2004 Domaine de Bellivière Coteaux du Loir Le Rouge-Gorge? At first I was reminded of a gamay from the Beaujolais by its dark ruby color and the light-medium body of the wine. The aromas of topsoil and forest floor were also not unlike Beaujolais, which I often find has a wonderful earthiness. The flavors of cherry, earth, and spice were strong and definite, which will make some people love it,and others hate it. Pineau d'Aunis is at its best--like many wines--with food. This is not really a stand-alone wine unless you are wanting to come to terms with it on an intellectual level. This is only going to work with food, and then think about something earthy like mushrooms, truffles, beans, and charcuterie. This is not a big fruitbomb: fat and sassy and easy to love. What it is, however, is textbook Pineau d'Aunis. And for under $15, it is certainly a very good QPR choice if you are looking for a traditional bottling of a very special grape. As such, shouldn't it get more than a B+? I sure think so, and so does Parker who didn't lose his nerve and gave it a 90 instead of an 89. Are there other grapes that routinely get consigned to the under-90 bin? If so, let me know what they are because I'd love to try some more of them. If they're as interesting as Pineau d'Aunis, they'll spice up my evening glass of wine for years to come.